Although only affecting a minimum number of services, satellite interference continues to be a problem for military, government, agency and commercial satellite operators across the globe. When interference does occur, such has a huge impact for all concerned and, naturally, satellite operators are working diligently to prevent and mitigate this issue's destructive effects. 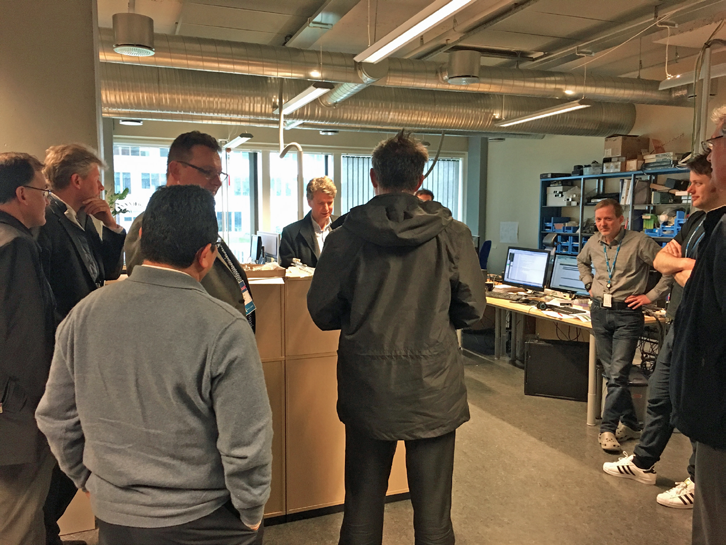 VSAT terminals are notoriously the biggest cause of interference as well as the most challenging to resolve and has become a huge focus for satellite operators that are seeking new methods to combat this unique challenge. Geolocation is a powerful and useful tool in the interference toolbox and is widely used for other types of interference, with great effect. Obtaining knowledge of the approximate location of an interfering source is often crucial as that data provides the key to resolving the problem. However, for VSAT networks where many terminals share the same frequency, geolocation has not really been a feasible option unless there was a minimum number of terminals. As mentioned above, VSAT terminals are widely reported as the biggest cause of interference and the most challenging and time-consuming to solve. Increasing the arsenal of tools to combat interference has to be a priority. If the source can be quickly located, that is a game changer for satellite operators that are seeking to resolve instances of interference and enables them to take the appropriate action to mitigate the interference. A VeriSat demo during a recent IRG interference workshop. Of course, with VSAT terminals being mobile in nature, the location of offending terminals could be changing constantly—being able to track this positioning in an ongoing basis can ensure all of the above, as well as solving interference problems with alacrity. Why Has Geolocation Of VSAT Terminals Been Difficult? Geolocation is based on receiving the same signal through two adjacent satellites and then measuring the Time Difference of Arrival (TDOA) and Frequency Difference of Arrival (FDOA). Together with accurate satellite ephemeris data, and assuming the terminal is on the surface of the Earth, the position of the unknown transmitter can be determined. The accuracy with traditional geolocation depends directly on the accuracy of the input data. This means that, in some cases, it can be extremely accurate and effective, whereas in other cases, such as with inaccurate satellite ephemeris data, it can be quite the opposite, with errors exceeding 1000 km. Applying this technology for VSAT terminals results in multiple results (correlation peaks) for Time Difference of Arrival (TDOA) and Frequency Difference of Arrival (FDOA). For a reasonable number of terminals, each peak reflects the position of one terminal. However, if the number of terminals becomes too large, the peaks flow together, and the results become u 25seless. 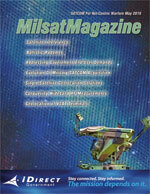 How Do We geolocate For VSAT? 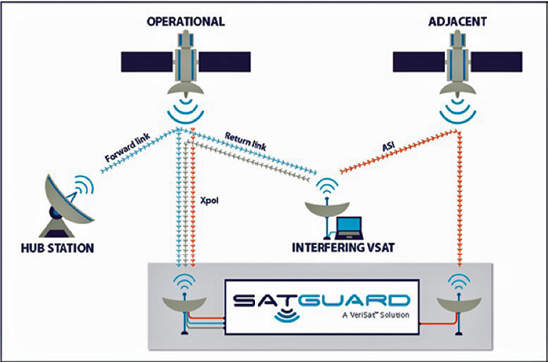 With the introduction of VeriSat’s SatGuard technology, geolocation of VSAT terminals is now possible for any VSAT network. SatGuard identifies the interfering terminals by the terminal ID. With this information, the VSAT network operator can perform the required actions to stop the interference. An important spin-off of this technology is the geolocation of VSAT terminals. The problems which traditionally occurred with VSAT geolocation are solved—all bursts are identified with the terminal ID, allowing correlation to occur for one terminal at a time. This provides excellent results for each terminal as there are no longer multiple correlation peaks. The VSAT geolocation module is based on software defined radio technology and complements existing geolocation solutions. The module decodes the operational satellite links and provides a terminal ID to every burst. VeriSat has worked with two leading geolocation solution providers who have tested this technology, all with excellent results. They have verified the VeriSat solution. This approach results in accuracy that is as similar as for continuous carriers and can provide satellite operators and government customers an effective tool for geolocating VSAT networks.